The roster for the Chicago Cubs is still in flux. Late last night, the Cubs officially released the above ditty, some of which I wrote about earlier in the evening, specifically Ian Happ. The Cubs could be looking to add a third catcher in the coming days. I have a series of questions about the consequences of the Cubs picking up another catcher: “What happens to Victor Caratini? Does he head back to Iowa? Does he get traded for bullpen help? Does he even stay on the roster?” There are just 4 days left to find out. Finalizing the bullpen would appear to be the main focus of the next two days. While the Cubs have had all winter to get this done, Theo and Jed have waited until the last possible second to do so. The whole thing could turnover in just a few days. The only thing I know for sure is Steve Cishek and Carl Edwards will be on the opening day roster. Tyler Chatwood earned a spot as has Montgomery. It also appears Allen Webster has a place on the 25 man. And that’s about it. Injuries and poor performances have taken their toll on the squad. The final three spots will depend on who is healthy enough to go on Thursday and that could change again in a week. Part of me is just waiting on a trade. I doubt it happens but it could. Then again, I did not think that this team/organization could ever be seen as dysfunctional under Theo Epstein. Yet, he we are. The Cubs signed free agent Danny Zardon. The 24-year-old former 3B and OF will be transitioning to catcher. 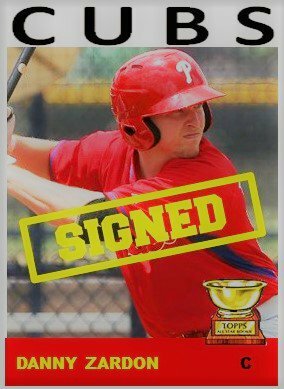 In college, he was all-world as a freshman at LSU as an OF and played his junior year at Nova Southeastern before being drafted by the Phillies in 2016 in the 17th round. He was released in 2017 after 18 games at low class A Lakeland. Then he played for the Joliet Slammers in the Frontier League the rest of that year and all of 2018. He will likely bide his time this spring learning catching in EXST before he likely ends up in Eugene or Mesa. The Cubs signed two more international free agents this week in Cristian More, a 17-year-old OF, and Jonathan Alvarez, a 19-year-old pitcher. Over at Baseball America, Ben Badler did not get to his Cubs 2018-2019 Review just yet but it is coming. In the meantime, you can go check out these two videos from his instagram account about two young international players the Cubs have been linked to for this July 2. They expanded their top 200 into a top 300 this week. Three players I profiled so far made the list. Glenallen Hill came in at 115 (end of the third round), Ryan Kreidler at 148 (4th or 5th round pick), and Grae Kessinger was slotted at 234 (7th or 8th round pick). Those will change some depending on their springs. I do have a draft profile coming out at some point over at Cubs Insider on Campbell University pitcher Seth Johnson. I will also be doing previews of Iowa and South Bend there as well, though the previews will probably come out the first week in April. They will be a little bit different than mine here. Spring Break is coming at the perfect time for me. After a hectic seven weeks of history fairs, academic team matches, and taking my wife to doctor appointments, I am really ready for baseball season to begin. Come Thursday, I will be sitting at home in my chair checking out the big league action. A couple days before that on Tuesday the 26th, it is going to get really busy at Cubs Central. Here is the plan…which is subject to change. – Tuesday March 26 – The Cards of Spring Training – I am excited to share my top ten cards out of almost 80 I made over the last 3 months. – Wednesday March 27 – Cubs Preview – Cautiously Optimistic – This will be a look at the upcoming season for the big league club. Considering the events of the past 20 hours, my optimism is at 2014 levels. – Friday March 29 – MiLB Preseason All-Star Team – Hitters – I really like the potential for this first half group. – Saturday March 30 – MiLB Preseason All-Star Team Pitchers – This was one of the most frustrating posts to write considering the Cubs starting pitching depth in the minors. – Sunday March 31 – The Final Spring Training News and Notes – This will basically be a preview of the affiliate previews. – Monday April 1 – Iowa Preview – The focus of this post will be prospects who are just a phone call away. – Tuesday April 2 – Tennessee Preview – The Smokies pitching staff will get most of the highlights except for some kid named *checks notes* Nico. – Wednesday April 3 – Myrtle Beach – The Pelicans look to be the beneficiary of the youth movement and the 2017 and 2018 Drafts. – Thursday April 4 – South Bend – The young Cubs will field a challenging roster of kids trying to break out in the system with several top 30 prospects. Friday April 5 – MiLB Opening Day Recap – Luckily, there will be no late night games, but I am curious to see who the stars of the first night will be. – Saturday April 6 – Preview of a Preview for Eugene – This is my favorite post to write as I look at players at EXST who have a good shot at making the short season club. – Sunday April 7 – The Weekly – This post will contain the first players of the week for the year. I also got the templates for the Players of the Week awards made a couple of days ago and I also got one made for Players of the Day, which is a new web site feature that will debut the morning of April 5.